The 35601L Wobble-Stator Pump is ideal for liquid composts, liquid manure and manure-slurry pumping and spreading applications at pressures up to 50PSI and a flow range of 0-24 GPM. The simple design of the wobble stators single universal joint gives you the inherent advantages of low pulsation and shear, solids handling and viscous liquids at an affordable price. Manure Slurry Pumps need to be reliable, efficient, and durable for farm and agribusiness operations. 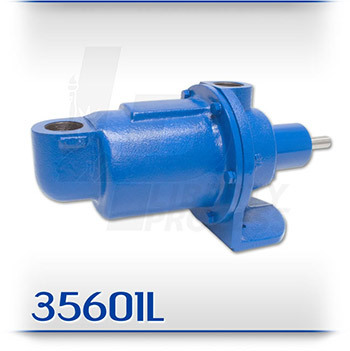 The 35601L Series comes in a Long-Coupled Version that is available in Cast Iron with standard Buna Nitrile Stator, mechanical seal, and a hard-chrome plated rotor for a long service life in operations on a manure spreader or liquid-compost trailer.